The Heatwave presented Hot Wuk ‘Carnival Reloaded’, with special guests Rampage, held at eartH in Shoreditch on Friday 16th November. Like Brixton, Shoreditch is a hive of activity at night and it felt like the ideal venue, as well as being central for transportation home. Unsure of what to expect, I made my way. Arriving at 11.30pm, there was a reasonable queue but got straight in. Being a first timer to eartH, I found that it was a huge venue, with a large dance area and an equally impressive stage. I was initially doubting the capacity reach as upon entry, it seemed slightly empty. However as with these large venues, once I moved through the crowds, it was evident that it was indeed packed and that this party had vibes. Known to host dancehall events, Hot Wuk is very different from the likes of Dancehall Episode. I suppose I should not compare, but I found that the Dancehall Episode events attract the distinct and almost distinguished dancehall lovers, yet by contrast, the Hot Wuk event seemed to be like the’ jerk’ phenomena currently engulfing us. What I mean is that it feels like dancehall is on the boundaries of being churned into commercial heaven, (along with jerk chicken). I could not help but feel that dancehall was plagiarised, taken and being driven into white middle-class suburbia. It almost felt fraudulent that young, seemingly middle class ‘shoreditchers’ were embarking into dancehall. Nevertheless, as I witnessed crowds of people enjoying themselves, I could not criticise the atmosphere, the overall enjoyment and the way dancehall was embraced. 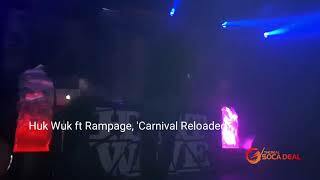 The event also featured Rampage and as the as the DJs rotated, the hype continued. Admittedly, there were times I stood back and guiltily giggled at the dance efforts in front of me. For the majority of the time the main part of the dance was performed, but all was lost as the steps or moves became more intricate. Lost footing, or ‘do your own thing ‘ was the order of the evening. Don’t get me wrong, you had your dance-hallers there. The young that have grown up within it and love it. Those are ones that stood out. Their rhymical love displayed it all. Whilst, we cannot expect dancehall to remain underground with its enchanting tones and rhymic moves, it is hard to resist ‘getting down and dutty’ in when you hear the tunes. However, we have opened it out to people who do not necessarily know the music. I saw people trying really hard to sing along and get to grips with the dancehall style. “Musically it’s fierce out there. Is it time to let the music and the culture soar stratospherically. The only way to do so is to let in people in…. accept all inputs” . Finding myself questioning the validity of dancehall promoters was difficult as music challenges the very essence of the stereotype. That said, should the energetic dancehall and bashment routines be confined to an underground dance movement? Why should it not be heralded and revered by all who like it? A good night does not necessarily culminate in being around your own people, only listening to what you think is your music. The entire experience is important to you as an individual and whilst Hot Wuk may not have appealed to me. It was a sold out event, there were vibes and people danced their hearts out, no matter their perceived or even preconceived challenges. Verdict: A good night out for the 18-25 only. A mixed crowd. Not for the serious dancehallers.